While the exact processes involved with the failure may not be known, clearly no one familiar with Acrobat or PDFs generally spent any time verifying that the “redactions” were permanent. 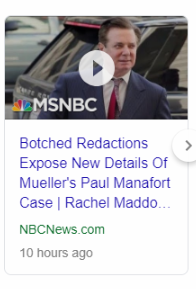 If defense counsel staff had opened the relevant files in Standard Acrobat or Pro, they could have easily verified the status of the redactions (it is worth noting that one of the first tasks the journalists undertook was to determine if the redactions were, in fact, permanent. ). 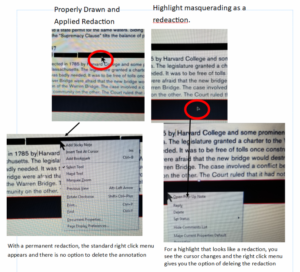 To help you avoid this error (we recommend processing redactions through i-View but for those looking for a more immediate test…), you or staff should open the files in Acrobat Standard or Pro (or through the on-line app) you are about to produce and inspect the redactions using the mouse/cursor. If the cursor changes when you move it over the redactions, you might be dealing with comments or unapplied redactions rather than the permanent deletion of data that is a true redaction. 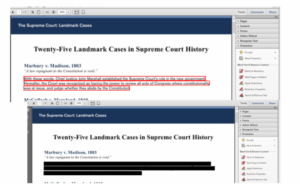 Acrobat has improved its redaction processing significantly over the years but if you are dealing with hundreds of redactions across hundreds or thousands of document, managing redactions “manually” poses many challenges. 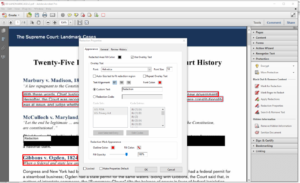 In an upcoming blog we will discuss how i-View can provide some order to the redaction process and to enhance the efficiency of your staffs’ efforts.